By second grade, our students have adjusted to learning in a classroom environment. They’ve learned the basics of reading, writing, and mathematics, and are ready to build on those as they learn new theories and ideas. In second grade, we add more advanced science to our curriculum, building on the general principles students began to study in first grade. We continue to explore social studies, with a focus on social justice. Students also learn how to enhance their social and emotional skills, including how to work well as part of groups and teams. In second grade, we deepen our exploration of literacy, mathematics, science and social studies. We use the Everyday Mathematics curriculum in second grade. This curriculum is designed to teach math in a variety of ways to reach students of all learning styles. In second grade, our literacy studies are divided into three areas: reading, word work, and writing. Each area teaches students a different aspect of literacy. Our word work groups will be differentiated based on students’ word and spelling knowledge. A concept will be worked on for one to two weeks until a final word sort is completed and shows proficiency. Word lists will be sent home with students to practice. and a unit on plant and animal relationships. Our social studies program is focused on inquiry and interest-based areas of study. and an overview of geography. Reading workshop - this is usually a 15 minute mini-lesson followed by 30 minutes of independent reading and small group instruction. We follow a balanced approach to reading that includes fluency, comprehension, and word work. Essentials - we go to Visual Arts, Dance, Drama, or PE. Since we have four essentials classes, students go to three of them once a week, and to the fourth essentials class twice weekly. Each quarter we rotate classes, so students will have an extra day in each essentials class by the end of the year. Second graders collaborating together on schoolwork. 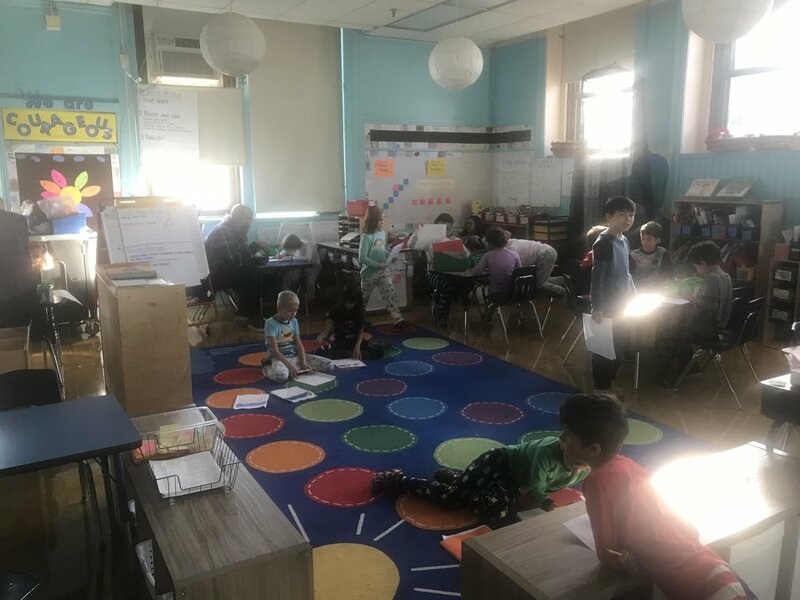 In second grade, during the first half of the year, homework may occasionally be sent home as an extension of, or practice for, regular school work. Apart from occasional projects, homework is not required. In the second half of the year, we’ll start to gradually increase the amount of work sent home, to prepare students for 3rd grade. This will still be considered practice work. However, we do ask and expect that students read for at least 20 minutes every night, either on their own or with a parent or guardian. Grades are based on student performance in each of our curriculum categories. Please reach out to your child’s teacher for more information on specific sections. Writing: 50% of the student’s grade is based on Classwork, 40% is based on Final Drafts, and 10% is based on Conventions. We’re still planning this year’s second grade field trips! Please keep an eye out for updates. We’ll send permission slips and information forms home in your student’s folder. We’ll also send updates via email and through the room parents. Our field trips will align with our curriculum, and we’ll take advantage of all of the wonderful opportunities our great city offers! We welcome all parents, guardians and family of second graders to join our classroom community! You can join us in a variety of ways. We always need help getting organized. You can sign up to help out with classroom organization here. Please note that, per CPS policy, you do need to be a registered volunteer. 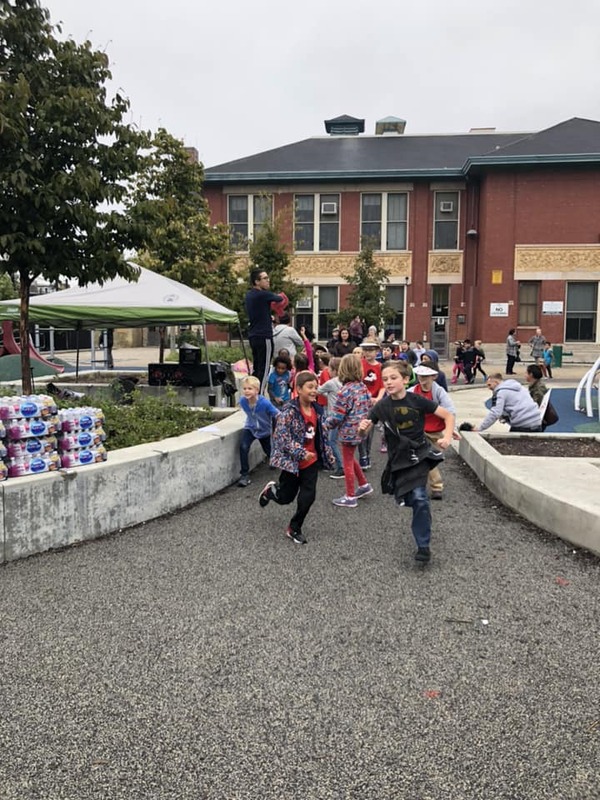 Second graders at our Ravenswood Walkathon — running as fast as they can! You can download introductory presentations from our teachers by clicking on the button to the right.